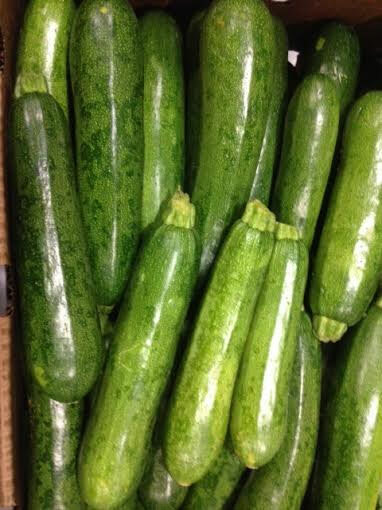 This unusual defect was recently spotted in a load of zucchini. It affect the surface of the squash only and does not penetrate the flesh. The surface shows an obviously mottled, poorly colored pattern. You may find this in various degrees, with some squash showing only minor traces of the defect. This defect, called Cucumber Mosaic Virus is not just found affecting cucumbers, but was first found affecting cucumbers, thus its name. Aside from squash and cucumbers this defect may also be found on lettuce, tomatoes, celery and peppers, as well as many others. This defect, or this virus is spread by aphids as they feed on the plant while growing. This virus can overwinter in perennial weeds, flowers and often crop plants by surviving in the roots. In the spring the virus grows with plant and emerges in the top leaves, where it is picked up by aphids and carried to other hosts. This virus causes a systemic infection. The USDA has not established a scoring guideline, falling back on the “when materially affecting the appearance line.” If you can plainly see the mottled areas, as shown in most of the squash shown above, score the squash as a defect, damage by mosaic. Mosaic is a quality defect, meaning it came from the field, while growing, and was evident during the packing process. The mottling will not progress, it will not become “more mottled” nor will it turn into decay. None the less, the mosaic does materially affect the appearance of the squash and is scored against the 10% tolerance for defects, and in extreme cases, scored as serious damage, against the 5% tolerance for serious damage. What does ‘Discoloration’ look like on zucchini? Barb, the cut stems are never scored as a defect unless they have decay. The gummy substance is not decay. If the cut is found on the squash itself it is scored as a defect if it penetrates into the flesh. Thanks for this informations and from this whebsite I can understend the difect of my zucchini. I live in Italy (Friuli Venezia Giuia) Azienda Agricola Biologica!